Premarin is a HRT (hormone replacement therapy) drug used by women to offset the symptoms of menopause. It is made from the estrogen secreted in the urine of a pregnant mare. 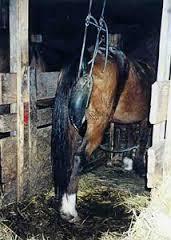 To collect this urging from mares the horses are forced to wear rubber urine collection bags. Typically the mares are placed in stalls, unable to turn or lay down, for months at a time. Babies born to these mares are sold - sometimes to slaughter. Premarin has been in use since the 1950's, but in 2002 a WHI (Women's Health Initiative) study revealed such startling results that the test was stopped (click here for more info). Women were urged to discontinue using Premarin, and the demand plummeted overnight. For the next 2 years the industry kept downsizing, with most of the mares and foals going to slaughter. The number of mares standing on the "pee line" was reduced from 50,000 to 10,000. Fast forward to 2015, and the industry is growing again. New markets have been tapped overseas, and new products are rolling out. Inform all the women you know about this terrible practice and urge them not to take drugs containing PMU. Help find homes for horses cast off by this industry.